RAPAPORT... Ethical practices in the global gem and jewelry industry dominated discussions at this week’s congress of the World Jewellery Confederation (CIBJO). Hundreds of industry leaders attended the event in Bangkok, Thailand, which ran through Tuesday. CIBJO president Gaetano Cavalieri proposed a framework for the colored-gemstone industry to ensure the highest standards of corporate social responsibility with regard to the supply chain. 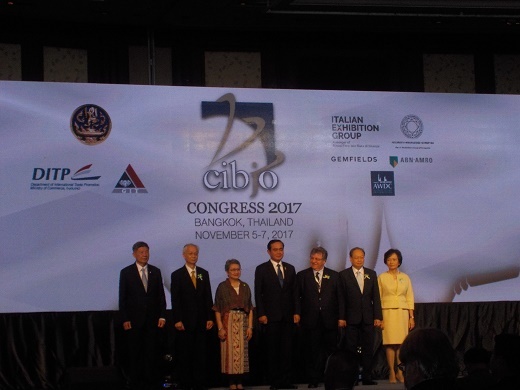 At the opening ceremony of the congress, which Thai Prime Minister Prayut Chan-o-cha attended, Cavalieri said the global gem and jewelry industry depended on strict compliance with the highest ethical standards to ensure its own survival. “If we lose the confidence of our consumers, and in so doing, undercut the value of our product, we will not remain in business, let alone prosper,” he said. One of the most difficult challenges facing members of the colored-gemstone trade is ensuring the integrity of goods entering the pipeline, since most rough materials are produced by impoverished artisanal or small-scale miners working in poor conditions. In his keynote address at the opening ceremony, Chan-o-cha outlined Thailand’s strategy “to establish itself as the world’s gem and jewelry trading hub by 2021.” The plan includes favorable tax incentives, as well as educational and marketing programs. In 2016, Thailand’s exports of gems and jewelry reached $14.25 billion, ranking the country as the 10th-largest supplier by value, according to the state-run Gem and Jewellery Institute of Thailand (GIT). Before the CIBJO congress, Bangkok hosted the World Ruby Forum, aiming to showcase the country’s potential to grow as a center for trading manufactured rubies.